the 200th anniversary of his birth. 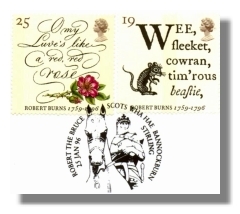 There are a number of features in Rampant Scotlandt relating to poetry. For ease of reference, these have been gathered together here and the page will be updated as new resources are added to the site. A collection of Scottish poetry with the accent on both the old favourites plus some more unfamiliar works which have a touch of humour. There are over 80 poems there already and the number is increasing all the time. Generations of school children have learned by heart the gentle humour of Walter Wingate's poetry. "The Sair Finger" is especially well known but here is a growing collection of poems by this Scottish schoolmaster. Biography of the poet and songwriter born in Kilbarchan, Renfrewshire. Biography of Robert Burns, Scotland's most famous poet with links to other resources (including all his poems) on the Bard of Alloway. Biography of Lord Byron. He was descended, distantly, from King James I and his Scottish childhood doubtless had an impact on the poet who scandalised his peers. Biography of Sir Harry Lauder the entertainer and song writer whose exaggerated caricatures influenced Scotland's image in the world stage. Biography of William McGonagall. Despite his reputation as the "world's worst poet" McGonagall's poems are nowadays read, quoted and enjoyed more than ever, although perhaps because they offer more amusement than insight. This 18th century writer started out as a wigmaker in Edinburgh and only later became a poet. His son, Allan Ramsay Jnr, became a celebrated artist. Sir Walter Scott is credited with giving Scotland a new identity and pride. His poems and ballads borrowed heavily from the legends of the Scottish Borders area where he grew up. Stevenson was the author of "Dr Jekyll and Mr Hyde" and "Treasure Island" but also wrote "A Child's Garden of Verses" and poems in the Scots vernacular like "Thrawn Janet". Tannahill was Paisley's most famous poet and he wrote in a similar style to Burns. A schoolmaster whose poems have been taught to generations of schoolchildren.